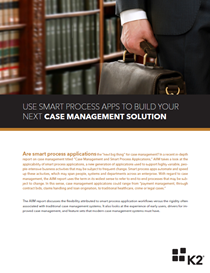 Are smart process applications the “next big thing” for case management? In a recent in-depth report on case management titled “Case Management and Smart Process Applications,” AIIM takes a look at the applicability of smart process applications, a new generation of applications used to support highly variable, people-intensive business activities that may be subject to frequent change. With flexible workflows and forms that manage information across disparate line-of-business systems, K2 can easily handle a case’s path, no matter how complex it might be, including parallel paths and loops that might be needed for exceptions, escalations, rule-based conditions, or multiple approvers or task recipients. In addition, K2’s integration with multiple line-of-business systems makes it easy for case managers to access the information they need to make informed decisions, no matter where that information may live. Dynamic case management is all about coordinating, controlling, documenting and making quick decisions about resources as they’re passed from one participant or team to another. Download this paper to find out how you can get the control and visibility you need to effectively manage each case while still remaining flexible and agile enough to change tracks or alter processes if required.